Emergency Electricians for all your needs. We meet all industry standards and qualifications. All areas covered in the Greater Manchester and Cheshire areas. Fully qualified to top industry standards. Blake Electrical are a reliable, professional electrical service serving domestic and commercial customers across the Greater Manchester and Cheshire area. Needing an electrician in a hurry doesn't mean you have to settle for anything but the best!! We are based by the Trafford Centre, and cover the areas of Greater Manchester, including Wigan, Leigh and Widnes to the west, and into Cheshire, including Stockport, Wilmslow and Altrincham to the south, and Bolton to the north. Blake Electrical is a reliable, professional electrical service serving domestic and commercial customers across the Greater Manchester and Cheshire area. Needing an electrician in a hurry doesn't mean you have to settle for anything but the best!! 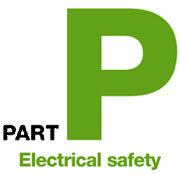 We do Contracted Jobs, emergency call-outs, maintenance works. We offer free estimates on all types of non-emergency electrical work for our fully-qualified electricians to carry out to the very highest standard. We have full public liability and are certain that you will appreciate the extremely professional nature of our work. We pride ourselves in particular on our ability to offer a fast, effective call-out service, responding to nearly all emergency callouts within the hour. 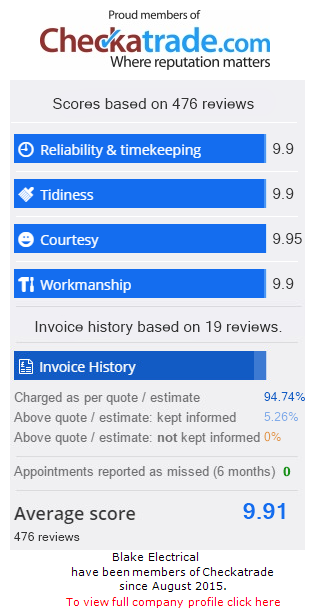 We appreciate that individuals, families and businesses can be hugely inconvenienced when electrics fail, and being able to call on a reliable, responsive company such as ours that will get you back up and running with a minimum of fuss is vital. 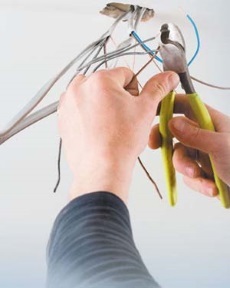 Needing an electrician in a hurry doesn't mean you have to settle for anything but the best! !